TRNAVA, Slovakia (JTA) — Growing up, Robert Sajtlava remembers playing near what used to be his native city’s Orthodox Synagogue. A rectangular structure with a deceptively unimpressive facade, its ornate ceiling and interior walls suffered extensive damage from the precipitation leaking through the roof and, occasionally, by trespassers who came through the rickety fence. “It was a ruin,” said Sajtlava, a 28-year-old catering professional, who is not Jewish. Since 2016, however, Sajtlava comes to that building every day as the manager of Synagoga Cafe — a chic establishment that a local contractor opened that year inside the space of the former synagogue. The launch followed a complicated and costly renovation project that retained and preserved much of what remained of the 187-year-old structure. In a recent and controversial development in Eastern Europe, former Jewish houses of worship left abandoned after the Holocaust are being renovated for commercial ends by contractors who capitalize on their Jewish history and incorporate it into a brand. Critics view the businesses as exploitative cultural appropriation in the wake of a tragedy. Advocates argue it reflects respect and nostalgia for Jews in addition to providing a vehicle for at least some preservation of heritage sites. The trend is especially visible over the past decade with the commercialization of several former synagogues and houses of worship. In 2013, Krakow’s Chewra Thilim was turned into a nightclub and, in 2016, into the Hevre bar, whose interior design highlights its Jewish past. In 2012, Warsaw saw the opening of Mykwa Bar, a drinking establishment with a translucent floor over what used to be a mikvah, or ritual bath. It occurs also in Western Europe: A 207-year-old synagogue in the city of Deventer, in the eastern Netherlands, is in the process of becoming a restaurant whose design will reference its previous function, according to the new owners. 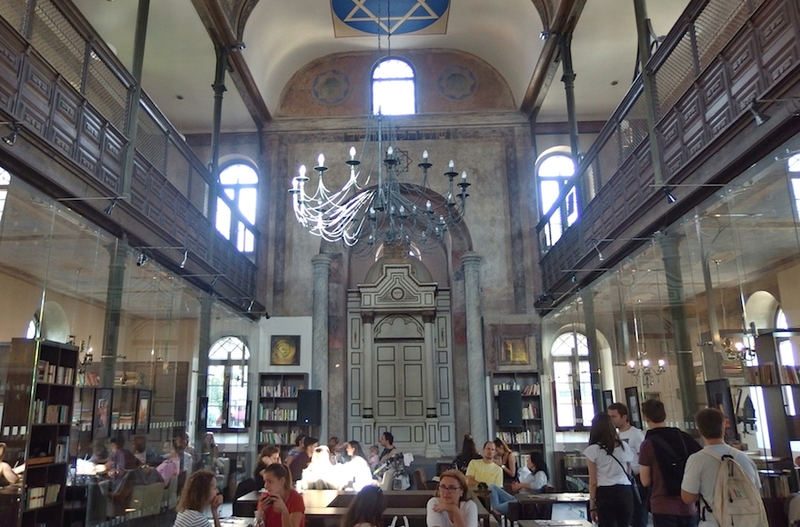 At the Synagoga Cafe, yuppie patrons sip pricey cappuccino on tables that are aligned with a platform on which worshippers would climb to open the wooden Torah ark. Flanked by marble columns that the renovators brought in to replace the ones that were plundered decades ago, the ark towers over the customers, with its reliefs of the tablets of the Ten Commandments in Hebrew and the word Jehovah. Overhead, what used to be the women’s section is now a second bar, complementing the one near the main entrance and facade, with its Star of David locked within a round window. The renovators did away with the separate entrance that once led upstairs in keeping with Orthodox requirements for separation of the sexes. But they kept the original stone stairs, which now lead up from the main entrance of the cafe, which has a capacity for 80 patrons. Even the collection box, with the Hebrew word for charity emblazoned over its slot, has remained intact. Europe had some 17,000 synagogues before World War II, according to groundbreaking research published this year by the London-based Foundation for Jewish Heritage. But the foundation has been able to locate throughout the continent only 3,318 structures that have been known to function as synagogues, and just 762 are used as such today. Some of the structures mapped by the foundation, especially in former communist countries, have been turned into residential homes — one notable example is the Rusne shul in western Lithuania. Others, like the Krośniewice synagogue in central Poland, became funeral parlors. Poznan in the country’s west even has a swimming pool that used to be a synagogue. In many cases, Jewish communities sold the buildings or received compensation for them. In others, Jewish communities still own the former shuls and are renting them to third parties. But these conversions differ from projects like the Synagoga Cafe and Mykwa Bar in that hardly any of them feature a conscious effort to commemorate the building’s Jewish past, much less capitalize on it. As with similar establishments in the region, the scene at Synagoga Cafe draws mixed reactions from Jews. Trnava, a city of 65,000 with so many churches that it is sometimes called “the Rome of Slovakia,” counted a Jewish community of some 3,000 before the Holocaust. Some 2,500 were deported to Auschwitz, leaving a congregation of only 100 by the 1960s. Even the survivors gradually left, leaving the unused Orthodox Synagogue and the neighboring Status Quo Synagogue, which was reopened in 2016 following renovations and now functions as an art gallery and concert hall with a memorial space. But the congregants’ tragic fate is not mentioned anywhere at Synagoga Cafe. Davidson’s Hebrew-language post on Facebook triggered a torrent of indignant reactions. Some noted that Israel and the United States have their fair share of deserted or defunct synagogues that have been turned into something else. The former Ansche Chesed Synagogue on New York’s Lower East Side is now an arts center. The Beth Abraham Synagogue in Auburn, Maine, was sold last year to a developer to be turned into apartments. But Sara Ben Michael of Haifa objected to the comparison. The Holocaust’s shadow and the absence of complete and informed acknowledgment of the genocide lie at the heart of resistance to the phenomenon, said Richard Schofield, a British artist based in Lithuania. He will publish a book this year titled “Back to Shul” featuring photographs from nearly 100 former synagogues that he toured last August. “The murder of the people who used to frequent the shul, the destruction of their centuries-old communities, it creates a different attitude and reality,” he said. In this context, Schofield said, “it’s hard to keep a rational attitude.” And yet he tends to support projects that result in the preservation of disused and decaying synagogues that otherwise would be destroyed, even if it is done for profit. Of the 2,556 buildings that used to be synagogues in Europe but no longer function as such, at least a third are in a condition ranging from poor to unsalvageable. Among the functioning synagogues, fewer than 10 percent are in those bad conditions. Sajtlava, the manager of Synagoga Cafe, argues that the decision to renovate the synagogue and retain parts of its Jewish heritage stem from a sense of commitment. “Listen, it would have been much easier and cheaper for my boss to find a different nice building, which was not ruined and not listed for preservation like this one was, and open a lovely cafe in it,” he said.